What makes us a secondary co-op? Click the chart to find out. The Valley Alliance of Worker Co-operatives is rooted in the ideals of co-operation, mutuality and solidarity. VAWC is itself an expression of co-operative principles — a “co-op of worker co-ops” that have come together as a means of strengthening the efforts of our individual co-ops to develop their businesses, serve their members, and contribute to the wider co-operative economy. Our core goal is to provide ourselves with the resources and support we need to advance our co-operatives, empower our members, and benefit more people in our communities. To see our recent activities read our Annual Report for 2018 or 2017. ‘No Bosses Here – A Manual on Working Collectively‘ - by Vocations for Social Change. A 33rd anniversary re-print by Levellers Press of this perennial manual. Table of Contents includes: Starting a Collective; Decision Making; Dividing of Collective Work; Dealing with Feelings; People Issues: Hirings, Firings, Leavings and Salaries; andthe movement and Social Change. 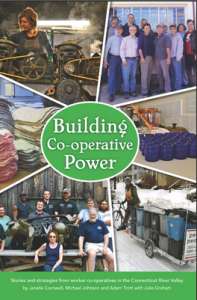 Worker Co-op Tool Box from Northcountry Co-operative Foundation: A free pdf download of a guide in which two VAWC Member Co-ops are case studies. 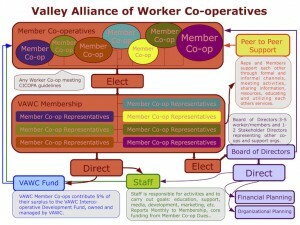 Look at VAWC’s Structure Chart to learn more about how we operate and what makes us a Co-op of Worker Co-ops.